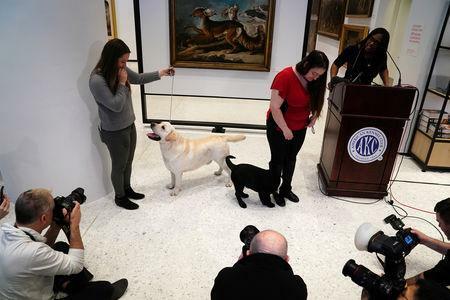 NEW YORK (Reuters) - The loyal and dependable Labrador Retriever hung on for the 28th year in a row to the title of America's most popular dog in 2018, the American Kennel Club said on Wednesday. The top 10 dog breeds in the United States in 2018 remained unchanged from last year except for the rise of the German shorthaired pointer and the decline of the Yorkshire terrier, which swapped ninth and tenth ranks, said the AKC, the world's largest purebred dog registry, based in New York City. After the Labrador, America's nine most popular dogs in 2018 in descending order were the German shepherd, Golden retriever, French bulldog, standard bulldog, beagle, poodle, rottweiler, German shorthaired pointer and Yorkshire terrier, according to the organization that registers more than 1 million dogs and litters a year. "Labs make wonderful companions - very intelligent, friendly and great with children," AKC Executive Secretary Gina DiNardo said in a statement. The ranks are based on AKC registrations, with the Lab the most registered canine in 2018, said AKC spokeswoman Jessica Rice D'Amato. The Labrador's 28-year run as most popular U.S. dog breed eclipses the prior 22-year record held by the poodle in the 20th century. The Labrador's popularity comes despite a dearth of prestige in the AKC's show circuit. In 143 years of competition, a Lab has never won Westminster Dog Show's revered Best in Show grand prize. "They are in demand for modeling, yellow and chocolate being the two favorites," Long said. "They are a classic, traditional, American dog. They are known to be loyal, great family dogs, gentle, smart, trainable, an incredibly well-rounded dog."